What’s not to love about easy parking? If access to parking is good, surely more would be better. Or, would it? 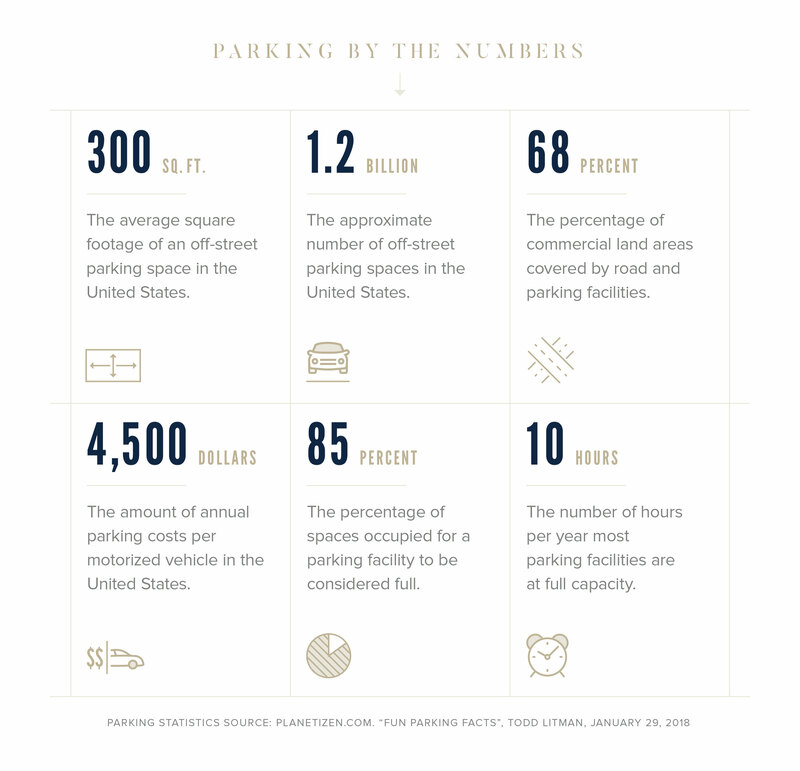 With conservative estimates around 3.5 parking spaces per car (ranging all the way up to estimates of 8 spaces per vehicle), 30-70% of American cities are covered with parking lots. The urban planning concept of “off-street parking requirements” (or “mandatory parking minimums”) spread quickly across the country after WWII. Clocking this dinosaur of a policy in at nearly 75-years-old. You see, parking lots are costly to build, yet free to drivers—limiting the ability to recuperate those costs. Parking minimums allowed cities to put the burden of parking onto developers. Thereby, eliminating that expense from municipal budgets. The method of determining these parking minimums, however, is far from an exact science. Over-estimation is the norm, creating large swaths of paved (and underutilized) land. Often, these lots occupy more space than the structures around them. As a result, buildings are pushed farther apart, making cities less walkable and traffic more congested. So, is there a better solution? We asked experts from various disciplines for their take. Here’s what we learned. It’s a transportation issue, not a parking issue. Many experts feel that our parking dependency can be attributed to a lack of public transit. “Investing in mass transit would alleviate parking considerations, especially for affordable housing,” explains Jeff Whiting, President and CEO of CREA. He points out that, “transit-oriented developments in other cities have shown how land use can effectively reduce the need for parking.” Which makes perfect sense. It’s like the Starbucks development strategy: determine where people are already walking, then set up shop along their path. People on foot don’t need a parking space. Older, denser cities, like New York, which developed before parking minimums became the norm, had to create comprehensive public transit out of necessity—making it easy to identify the pedestrian path. But what about sprawling, car-dependent Midwestern cities with little public transit infrastructure in place? “Going forward, we have to prioritize, or at a minimum, give equal thought to all modes of transportation—bikes, pedestrians, transit, and even scooters,” says Katie Wertz, Senior Associate with Greenstreet Ltd. “I think cities that value all modes of transportation have the ability to create more equitable places that ultimately are more attractive to the market.” Indianapolis is working on it. And as construction of the Red Line chugs along, we’re curious to see how developers will capitalize on the increased foot traffic along its route. In the future, we may not park at all. With so much research and investment going into autonomous vehicles, experts are mostly in agreement—self-driving cars are coming. How will their arrival affect the parking landscape? Will they even need to be parked at all? “I don’t see them parking,” suggests George Tikijian III, Tikijian Associates/Cushman & Wakefield. “I think driverless cars will just keep circling. They’ll be a shared asset. What’s the point of owning your own self-driving car if it’s just going to sit there?” Following this line of thinking, if our cars are out earning their keep while we’re not using them, what’s to become of our parking requirements? “I imagine that when these become mainstream, the parking requirements will drop off tremendously. The question is will that be in 10, 20, or 50 years?” Tikijian continues. What if parking dollars could instead be spent on public improvements? We also heard that parking requirements limit a city’s ability to evolve or innovate. “For the dollars spent on parking infrastructure, developers could repair every road leading to their building, replace every sidewalk, install public art, improve lighting, the list goes on,” VP of Indianapolis Economic Development for the Indy Chamber, Ian Nicolini, explains. He imagines the potential if businesses could think about their physical locations not simply as somewhere people need to ‘get to,’ but as an integral part of a city. “They could ask themselves, ‘What is the best use of our resources, and how can we get creative for the benefit of our employees and our neighborhood?’” To us, that sounds like equitable and creative urban development. The future is uncertain, so flexibility is key. Such limitations are forcing developers to think more creatively about the long-term use of their parking structures. “You see a lot more intertwined garages—floor 1 retail, offices on 2 and 3, and then parking mixed throughout the middle. When the parking is no longer needed, it can be converted into storage space or more offices because it was built to code for those uses,” Greenwood notes. Since we can’t know the future, flexibility may be the best parking policy. We work with urban developers who prioritize innovation with every new project—parking solutions included. We believe your branding should be considered, early. Let’s talk about your next ambitious project.